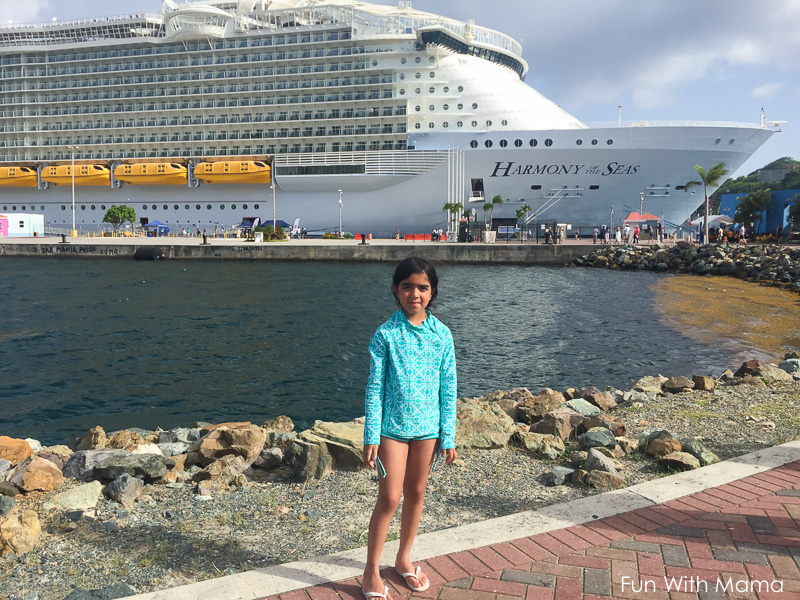 This blog post includes a Royal Caribbean Harmony of the Seas review and some thoughts on traveling aboard Harmony of the seas with kids.It includes a travel diary with outfit inspiration, activity ideas and more. 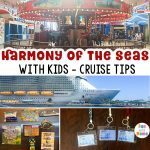 Don’t forget to check out my Harmony Of The Seas Tips here. 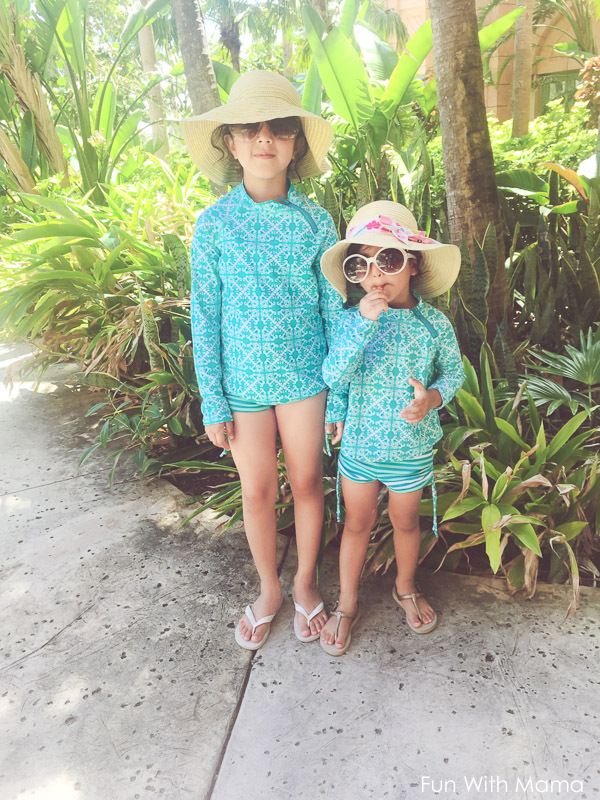 This is part 3 of our holiday post. 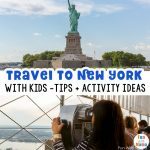 You can find part 1 and 2: Tips and activities for traveling with kids to New York here and Miami family vacation ideas here. This is a very long and picture heavy post. I tried my best to include as many details as possible. We booked this holiday with some of our closest friends. The more people you go with, the more fun you will have! I pre-booked all of my shows. You can find my show calendar recommendations on the tips post. 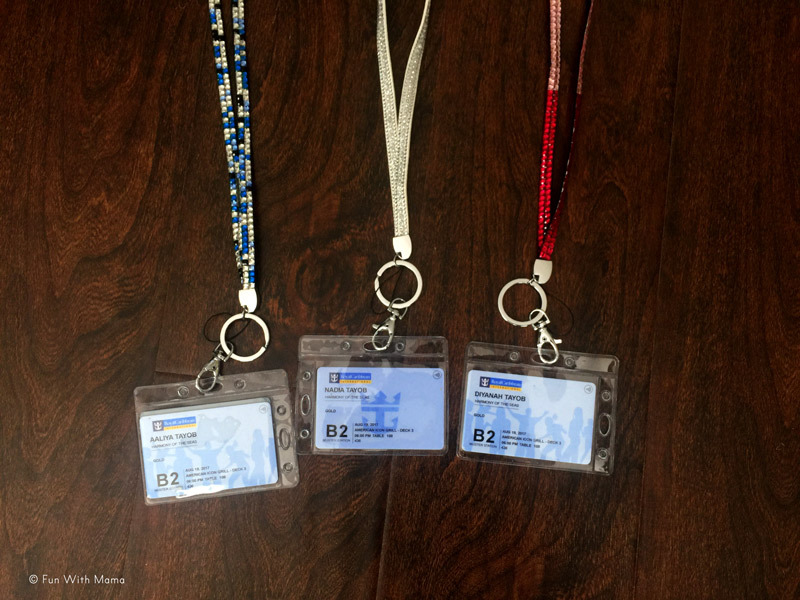 I made sure that all of our cruise documents and luggage tags were ready and completed. We discussed whether we felt the drinks package would be necessary. We do not drink much soda and so didn’t mind having only water, tea and hot chocolate on our cruise. I packed bottles of water in my luggage to bring onboard. I made a reservation for the sushi making class online. 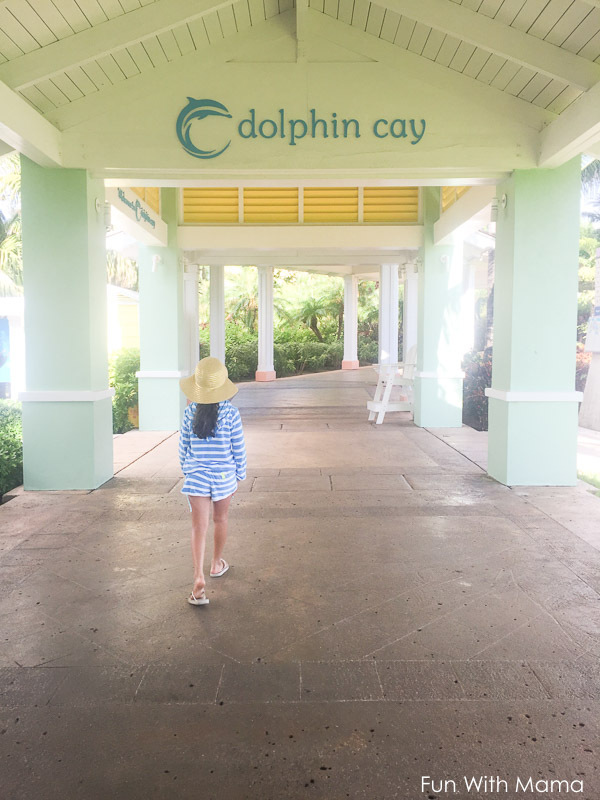 We reserved the Dolphin Experience at The Atlantis. We decided that we would be buying the digital CD of the cruise that includes all of our pictures. We booked a 7 Day Eastern Caribbean Cruise. The stops included Nassau, St. Thomas and St. Kitts. 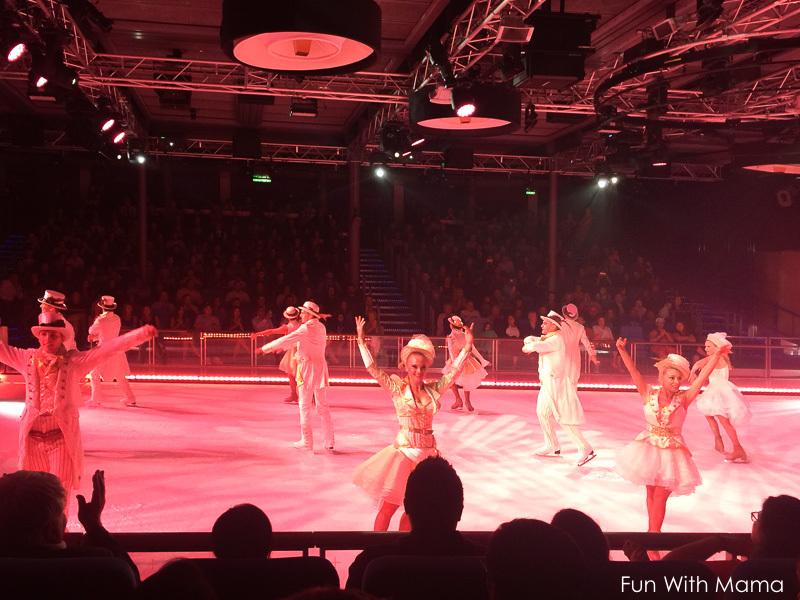 I had pre-booked on the phone all of our evening shows and I highly recommend, if you are going to be cruising on the Harmony of the Seas, that you do this too. This gave us entry into the theater venue 15 minutes before guests without reservations. That means we could choose our seats. 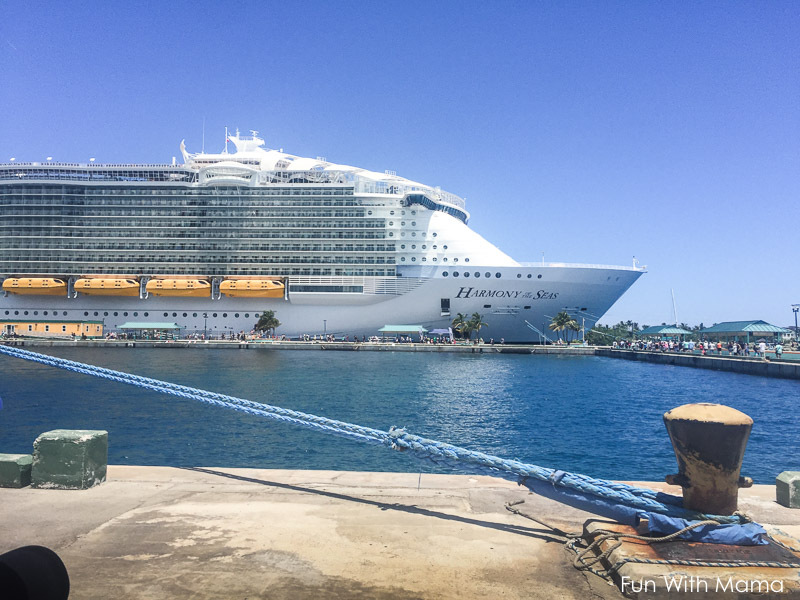 Unfortunately, we didn’t always get there in time… but we tried our best throughout the cruise. We reserved an interior room with virtual balcony and a connecting interior room. 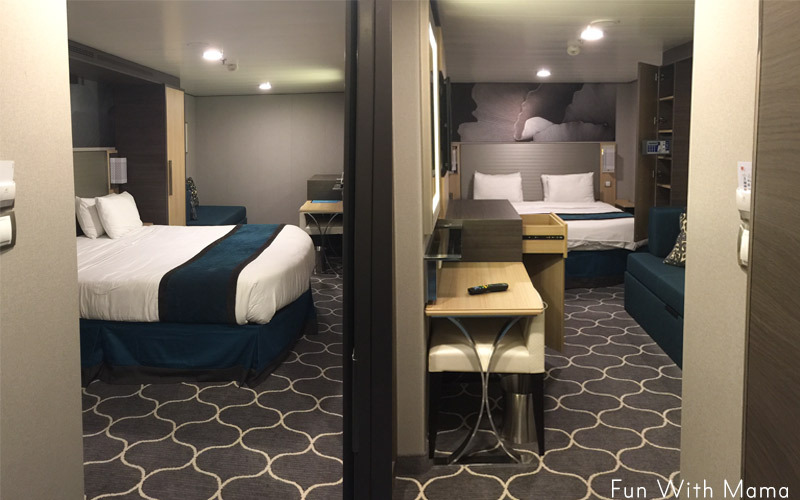 We hardly spent time in the room as we were always busy roaming the ship so I think we made a great choice with our rooms. Our stateroom numbers were 9438 and 9440. Please note that the rooms you are seeing above are not our actual rooms. I realized on the day that we were leaving that I forgot to take a picture. So I snapped a picture of clean rooms across from us. My staterooms were almost exactly like this, except the one on the left had a virtual balcony screen. These rooms are considered forward side. We were on the same side as the Adventure Ocean kids club, Royal Theater and the Spa and Fitness Center. 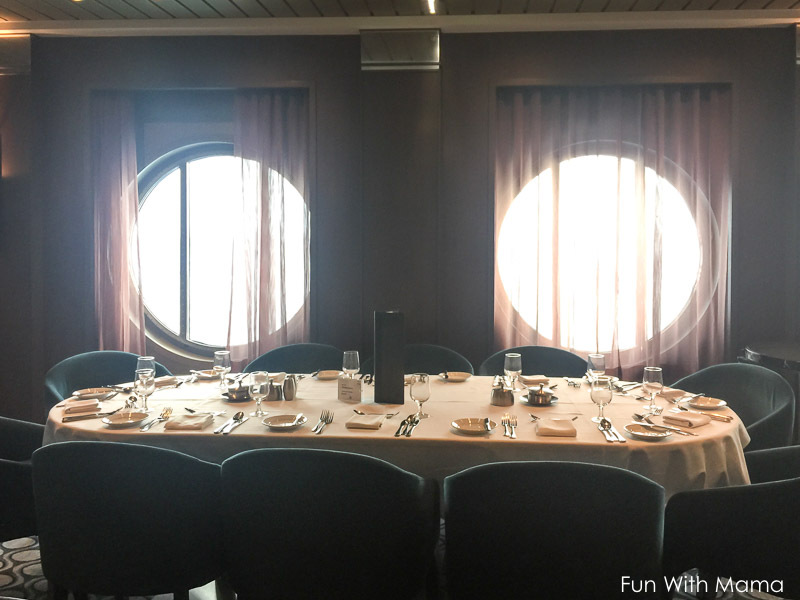 Our dining area, however, was on the other side of the ship. Since we had fewer days in Miami, we needed to make the most of our hours left at the Fontanbleau hotel. We opted to board the cruise a little later than we normally would on a cruise. Our husbands dropped us off at the port, as they went to go and return our rental cars. We were not allowed to check in without all members of our party because my son’s ticket was linked to my husbands. So we waited in the waiting area for about 30 minutes. After that check in was simple and smooth. Since we checked in late though, we missed our first fun photo opportunity. We brought along our lightweight stroller. This goes everywhere with us! I downloaded the Royal IQ app before we boarded.. This app is a great help when trying to find out what is going on during the day. It includes a calendar of events and you can make reservations for activities. Also, we opted to get the Phone service for a once off payment of $7.95 per phone line. This allowed us to call each other while we were on the ship. Please note though, that this app does have its faults. The phone calls did not always go through and sometimes they would ring on one side, but not on the other person’s side. Since we were late, there was no way that we were gonna get to the pools before we left the port. Once we boarded, we put all of our hand luggage in our room and then it was immediately time for the Mandatory Guest Assembly Drill. This is important and all cruisers have to be at their station. This drill shows you where you should report to in the event of an emergency. After the drill was done we went up to the deck to watch our ship leave the dock. We always watch this outside.. it is SO beautiful to see! The only thing, was that we didn’t actually realize when the ship started moving. On the Disney Cruise we went on there was some exciting horn blowing going on when we began moving. Here, we only realized we moved a few minutes after we actually left the port. My internet wasn’t working yet and guest services was not open until after dinner. I had no internet for the first few hours of the cruise and I began to panic just a tad. I need internet because my business requires me to be connected at all times. We took a walk around the ship to see all the different neighborhoods. There are 7 neighborhoods each with their own unique vibe. We chose the 6pm early dining reservation and it was perfect! During the cruise we often received our main course around 7pm. We were so happy with the table we got… it had the most beautiful view of the ocean. If you get sea sick, however, then don’t sit facing the windows. You could also get these sea sick bands to help alleviate symptoms. I used them on my first cruise. Our waiters came over and introduced themselves to us. We reminded our head waiter about our dietary restrictions and also asked to be served Indian food dishes on top of the current menu items each night. They said they would happily accommodate us in our requests wherever possible. The warm cake is only served on the first night of the cruise. 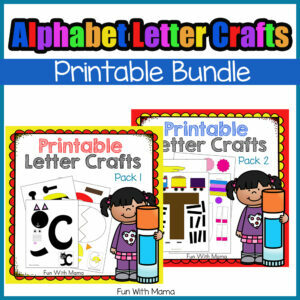 Make sure you order this!!! If you are a chocolate lover then you will understand it when I say that there are no words to describe the pure delight found in each and every bite of the cake. I wish I remembered the name of the cake! After dinner I went to guest services and sorted out my internet package. While we waited in line we used the app to make reservations for the Rubicon, Sushi Making Class as well as the Guacamole Making Class. The line was a bit long at this time. We purchased our lanyards in the boardwalk area. I seem to buy these on every single cruise so now I have come up with a storage solution for these. 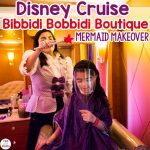 Since I know that our family loves cruises and that it is likely that we will be going on many future cruises. I love these containers. We went for the Grease theater show at 8.30. It was really fun, although I’m not sure it was completely appropriate for my kids. Some of the things in the script are a little more mature. The show was amazing though! From the props, outfits, singing and more… this show truly brought Grease alive! The kids club was only open today between 8 – 10 pm so the kids didn’t get a chance to go explore it. 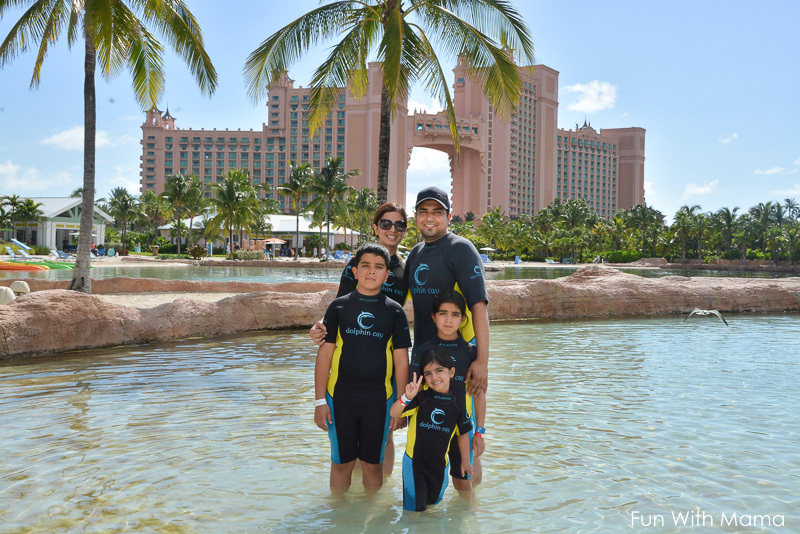 We chose to go to the Atlantis hotel for the dolphin experience we booked a few weeks ago. We went to eat breakfast at The Windjammer breakfast buffet at 7am and went off the cruise around 7.45. We found a limo taxi that could accommodate our group of 10 people. I wasn’t sure if the kids would be scared to play with dolphin’s, but I did know that they were really excited about this. 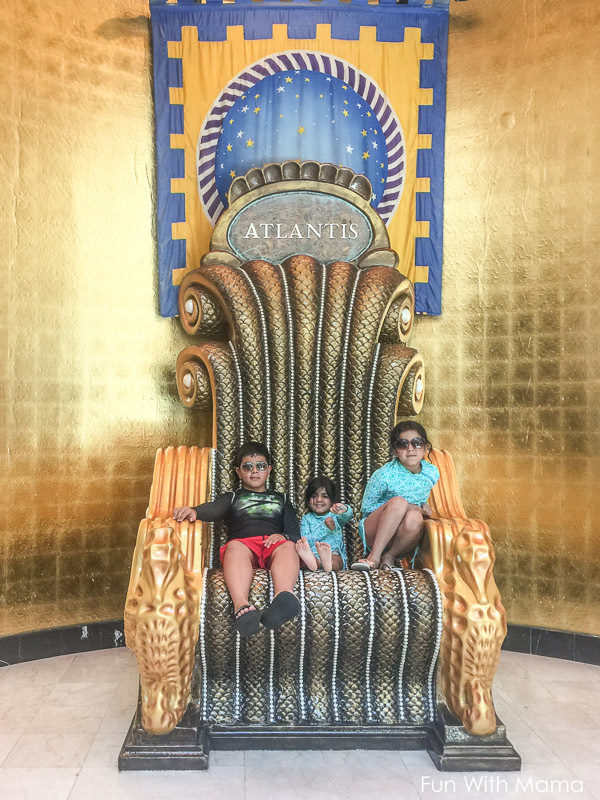 My older two have done the dolphin experience at The Atlantis in Dubai twice before but it would be my 3 year old’s, Diyanah’s, first time. We had the most wonderful dolphin trainer guiding us through the process and he really made it extra special for each of our children. Our dolphin’s name was Julian. 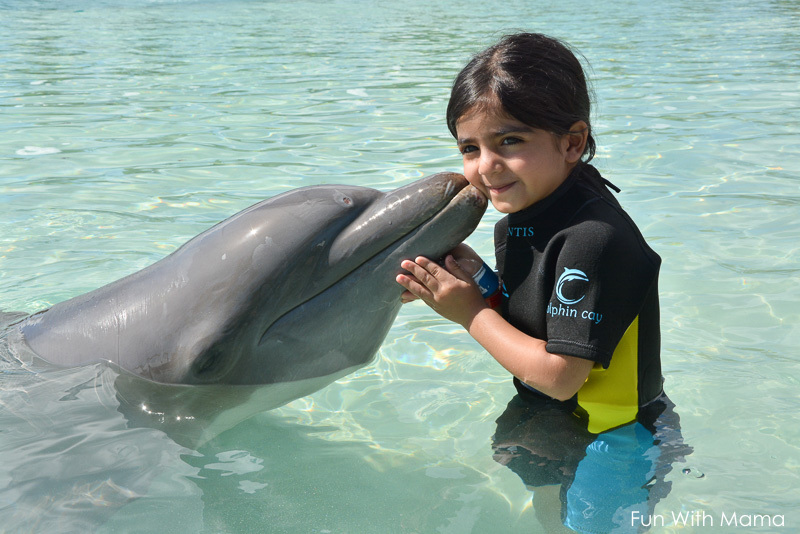 I do believe that the dolphin experience is something very special and I recommend that you try it. I also suggest you buy the photo package. It may seem like a lot, but I promise… that photo package will keep the memory alive. The Atlantis is a really beautiful hotel. There are ponds where the children can look at different types of fish and I can totally imagine spending a whole day there. Plus, how gorgeous is this throne photo opportunity?! Our lightweight stroller stroller has really come in handy, especially for these type of excursions. At the port you can have your children’s hair braided. I opted to get 2 small braids for each of them to wear throughout the rest of the cruise. Our friends opted to braid their daughters entire head. She had quite the wait… but it will be something she will always remember. 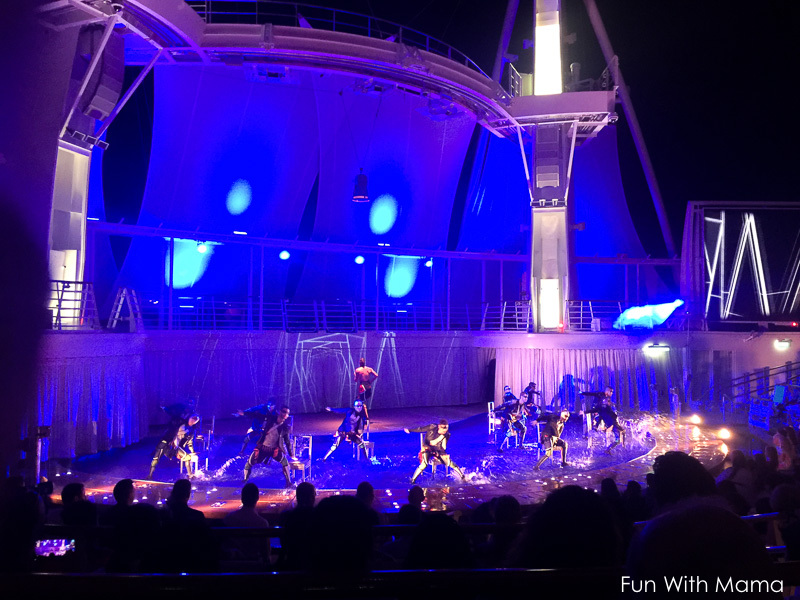 As soon as we got back to the cruise ship we had our Escape The Rubicon experience. 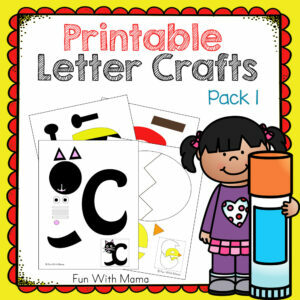 The minimum age to participate in this activity is 14 years old. To our husbands disappointment, we didn’t solve the puzzle before the time was up… we probably needed just five more minutes. That didn’t mean we had any less fun! What a special and memorable experience to have on board with your friends. We then went to our staterooms to get ready for our first formal night. 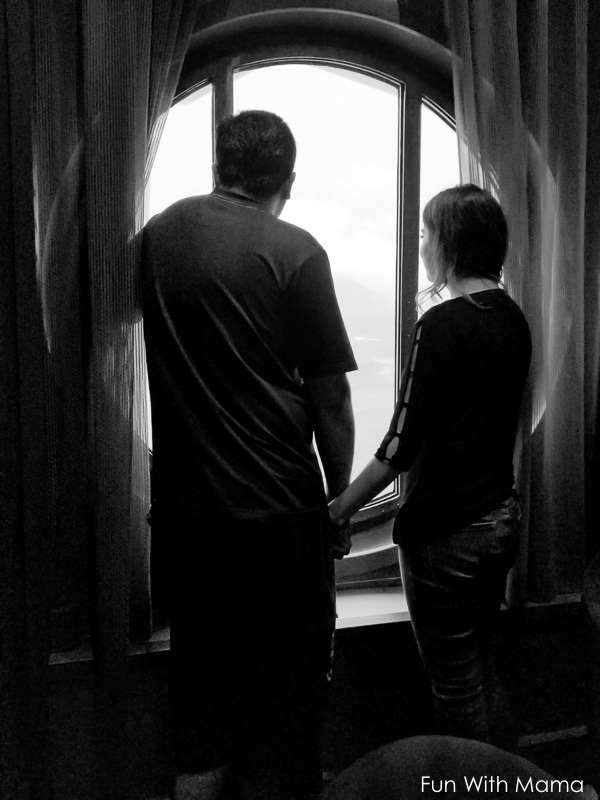 After our first cruise, many years ago, we knew that we would be purchasing the digital cd with all our cruise pictures at the end of our cruise. 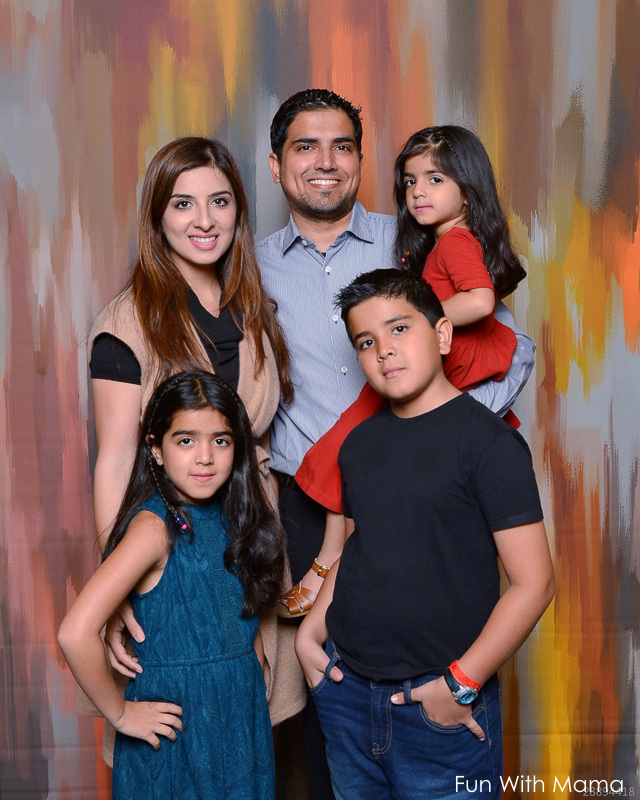 To me, the package is completely worth it because we get some amazing family pictures. If you decide this at the beginning of your cruise, you will ensure that you participate in every single picture opportunity. There are photographers all over, constantly taking pictures of you on the cruise. Make the most of it. You could also buy each picture individually, which works out more cost effective if you like fewer pictures. We immediately went to The Fine Line Aqua Show. The stunts were amazing. The first 2-3 rows are a soak zone.. and trust me when I say my kids were SOAKING wet! This is a must watch show. The acrobatics, the vibe, the whole set was spectacular. 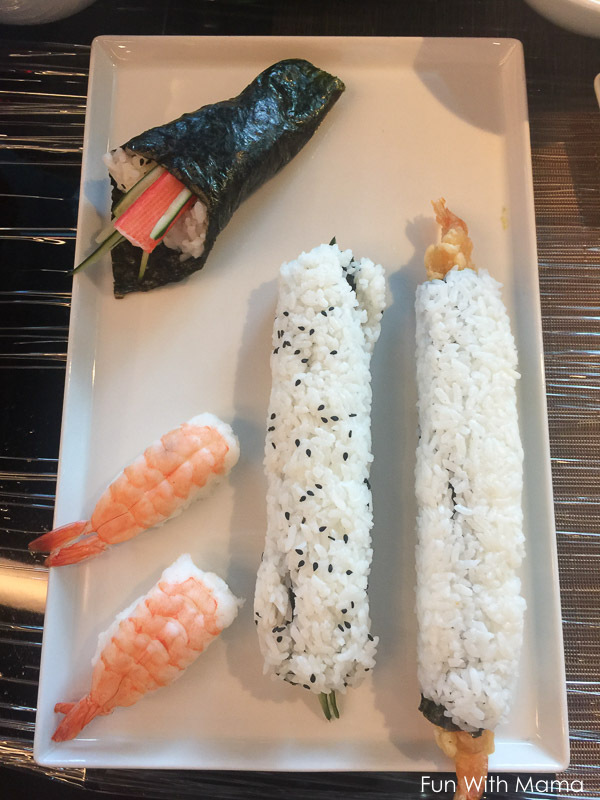 I went for the sushi making class while the kids went to the pools with my husband. All the ingredients were laid out for us and I really had so much of fun in the class. The instructor stood at the end of the table and showed you how to do each step. Then you would try it and he would come around and double check. This was definitely worth it and I highly recommend you do it, if you like to eat sushi. When you are done you get to eat the sushi! Afterwards, I joined the kids at the pools. We tried out The Perfect Storm slides today. It is amazing how we as adults get more and more chicken the older we get. The kids encouraged me to go up and try the slides and surprisingly, they weren’t really that scary. It was fun and I would definitely do it again. Plus, my kids feel all special that they made their Mama try the slides out. They are so proud of me. We enrolled the kids into the kids club for the evening while we went to watch the adult comedy show. It was HILARIOUS! I love comedy shows. 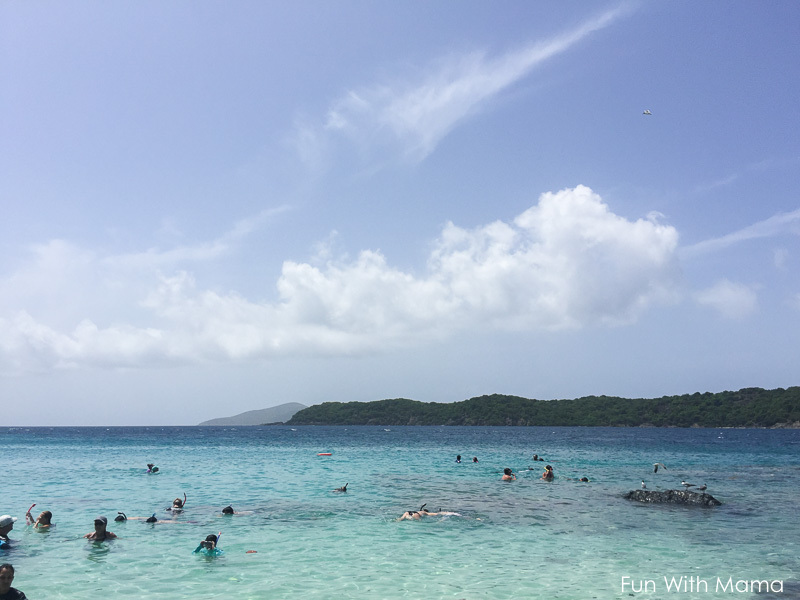 St Thomas was definitely one of our favorite ports. There were two beach choices that we could go to. Each one would take about a 45 minute drive. 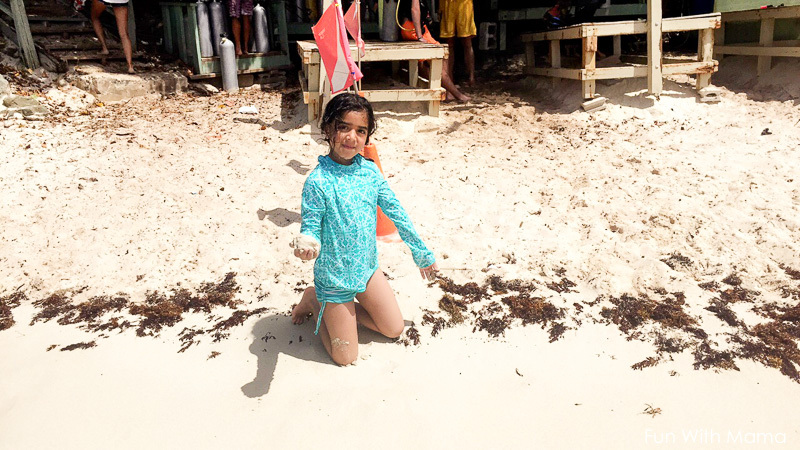 One of the choices was Magen’s Bay . It is named one of the world’s most beautiful beaches by National Geographic. 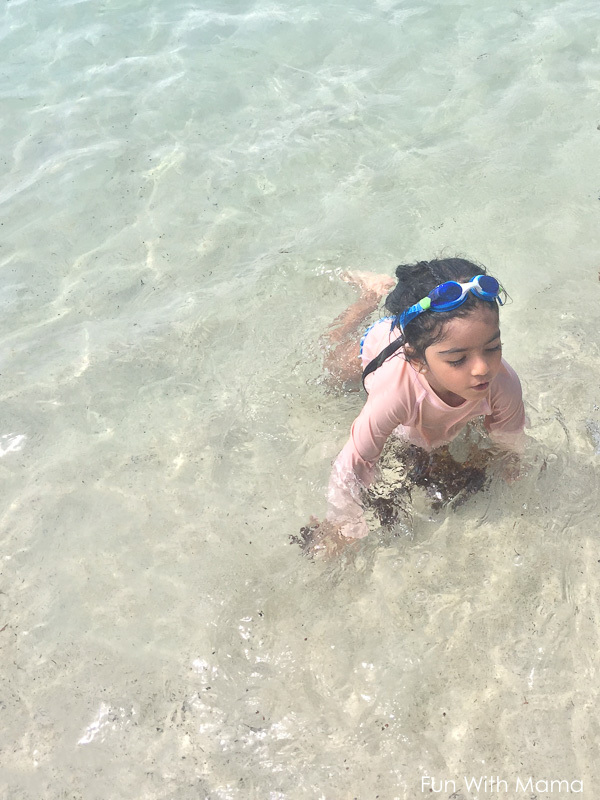 Although Magen’s Bay sounded like the best option, we chose to go to Coki beach instead because it had snorkeling opportunities for the kids. I am so glad that we went with this choice. The taxi ride to Coki Beach was about 45 minutes. Once you arrive at the beach, make sure you let your taxi guy know what time you plan to leave so that he can come back and pick you up. We rented chairs and umbrellas, which was wonderful. It gave us somewhere to leave our things. The water was nice and calm, there are no real waves. The only downfall of the place is that it is really very busy. There are a lot of people everywhere, from the chairs, to the rocks, to the beach water. While the beach is beautiful, what is going on underneath the water is even more magnificent. 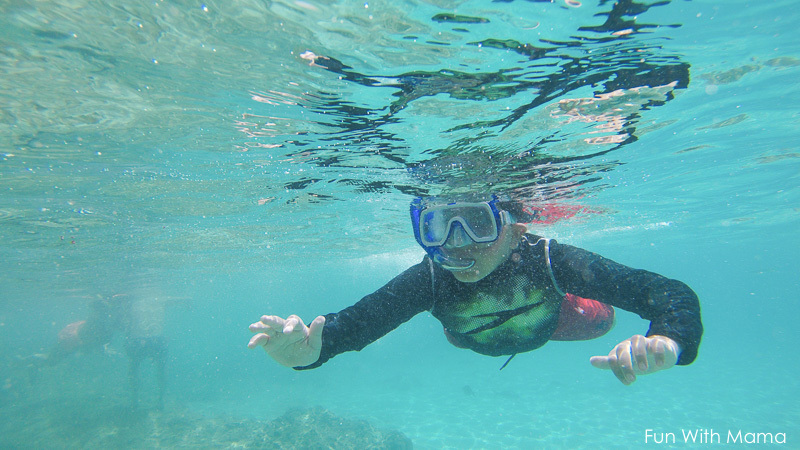 If you put on your snorkeling gear you will be surprised by what is right at your legs. 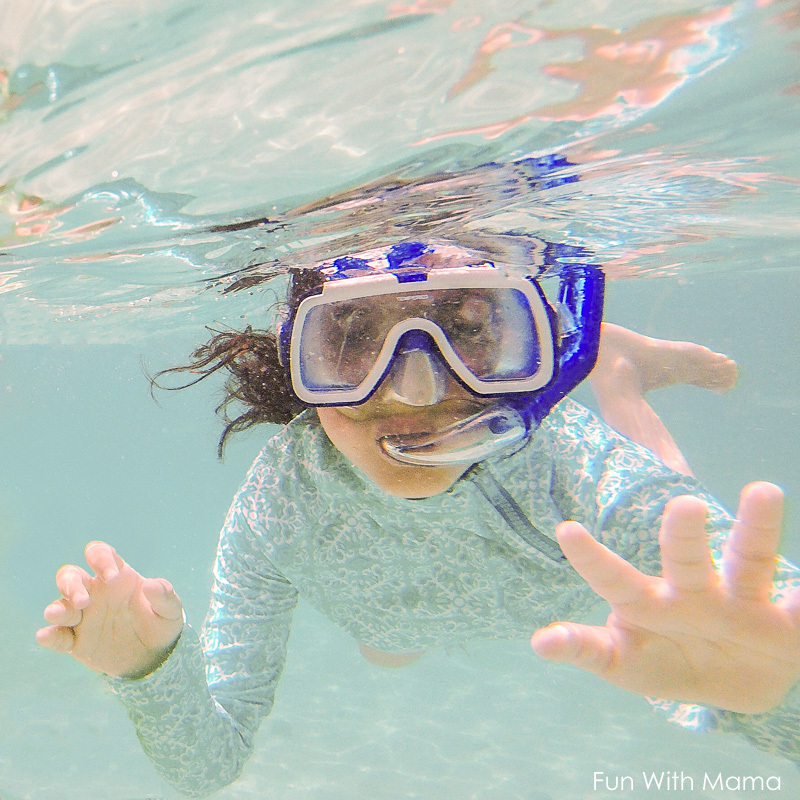 I purchased this kids snorkeling mask set to use for future trips because it seems to be a lot easier for kids to use. We could have climbed some of the rocky areas if we brought water shoes. The underwater pictures were taken with a GoPro camera. I was mesmerized just watching my children go under, then quickly pop back up , beaming by the excitement of what they had just seen. 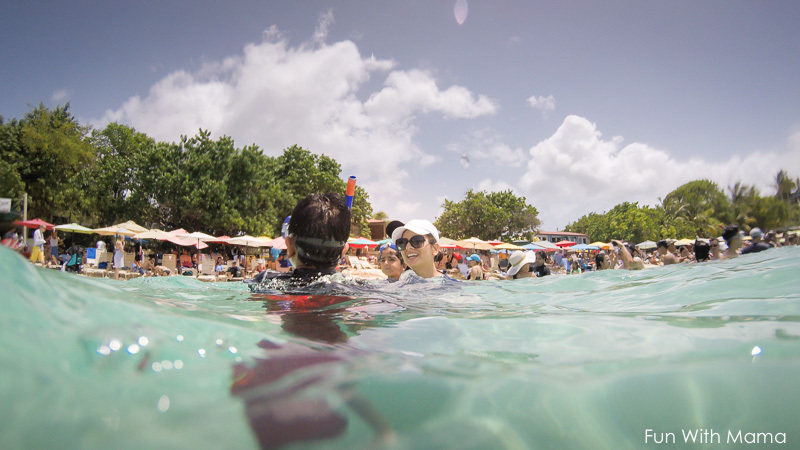 There are literally fish everywhere in the water… even in the shallow area! I especially loved that Coki beach has a good space of water that isn’t too deep. An adult can easily walk within a large area of water without needing to be lightly swimming. We were so sad when our time was up and we needed to leave. I definitely would like to go to St. Thomas again, maybe for a few days instead! When we got back to the port we stopped by the Del Pol nail polish store. They have color changing nail polish that changes when it is in the sun. My girls were so excited to try this so we bought ourselves one glitter filled color and immediately painted it on right outside the store. I mean, who could contain that excitement?! Our waiters spoiled us by creating a lobster and shrimp pasta for us. 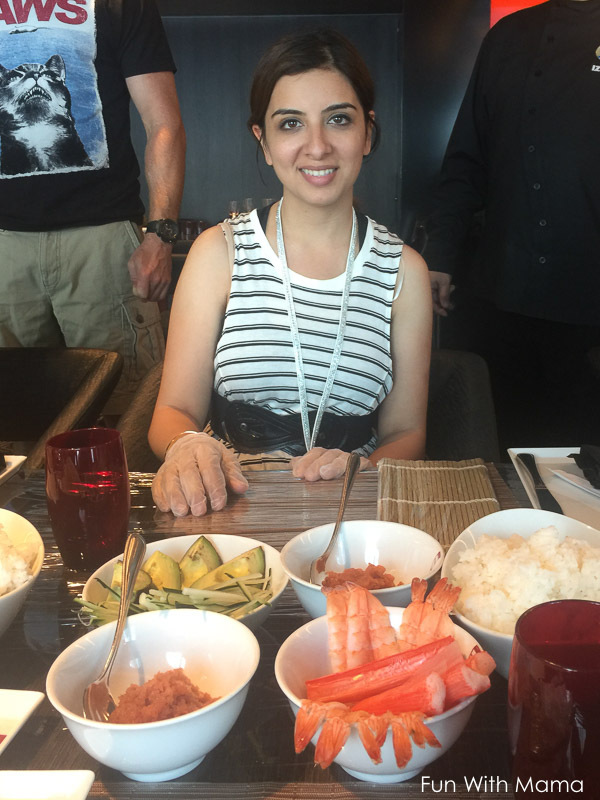 We had a somewhat restricted diet in terms of meat so they found a few creative vegetarian and seafood dishes to give us each and everyday. That made us feel well taken care of. In the evening we went to the Headliner show which consisted of a juggler doing juggling tricks. He was talented, that’s for sure. 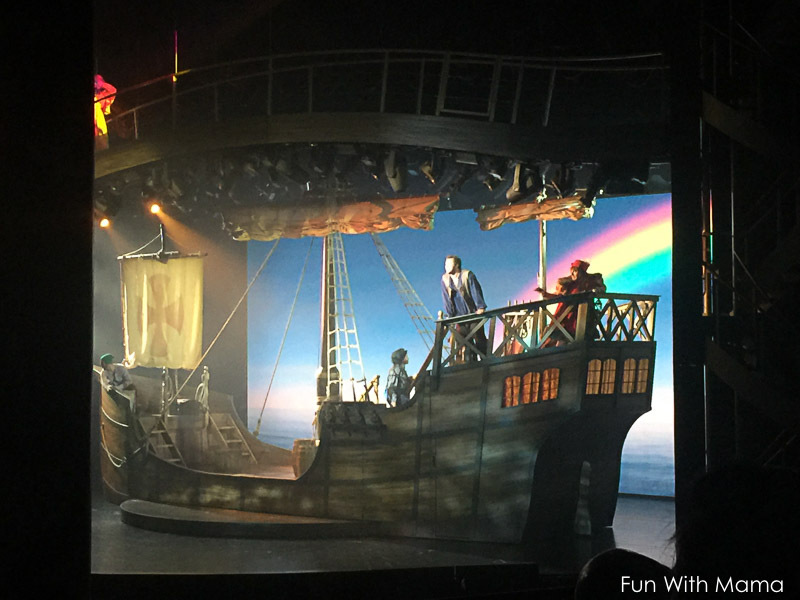 I thought the show was okay and would have preferred to explore other activities on the ship instead. My husband, on the other hand, enjoyed the show! We also went to the Love and Marriage Game show. 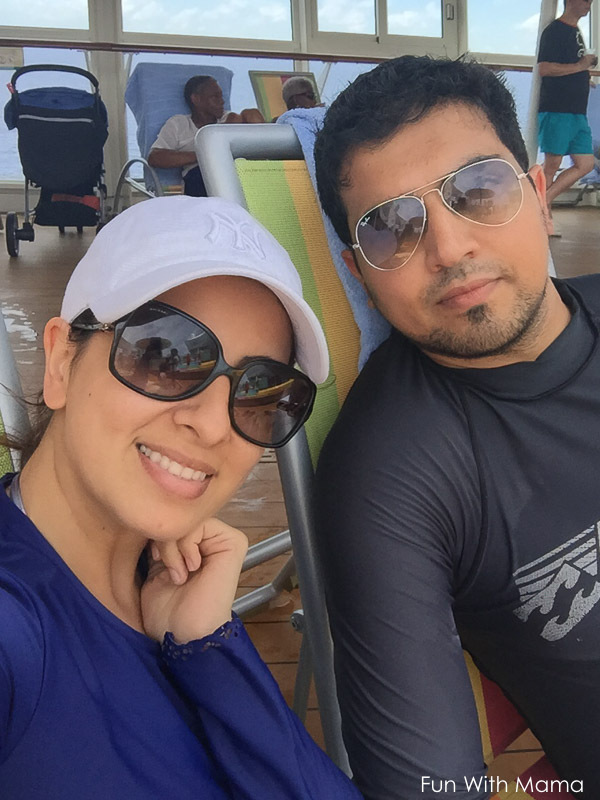 It was hilarious and definitely something fun to do as a couple onboard. We decided to take it easy this morning and sleep in. We have been keeping ourselves so busy during this holiday with not even a single moment of relaxation. There has been so much to explore that we want to experience everything! We went to the Windjammer buffet for lunch. The view was amazing. St. Kitts is truly beautiful. 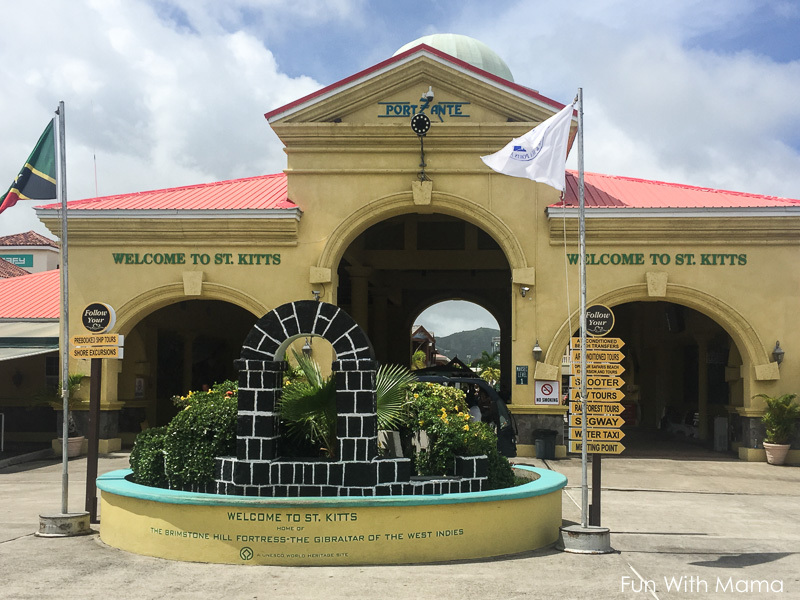 St. Kitts didn’t have as much to do. There were just some little shops. We decided to go on a little treasure hunt and see all the fun trinkets we could get. Most stores had little free trinkets for cruise guests that would visit their stores. You just needed to show your keycard to get it. I wish we had realized that we could collect charms from DI Diamonds in each port, before we reached our last port! Plus all the little trinkets were fun. 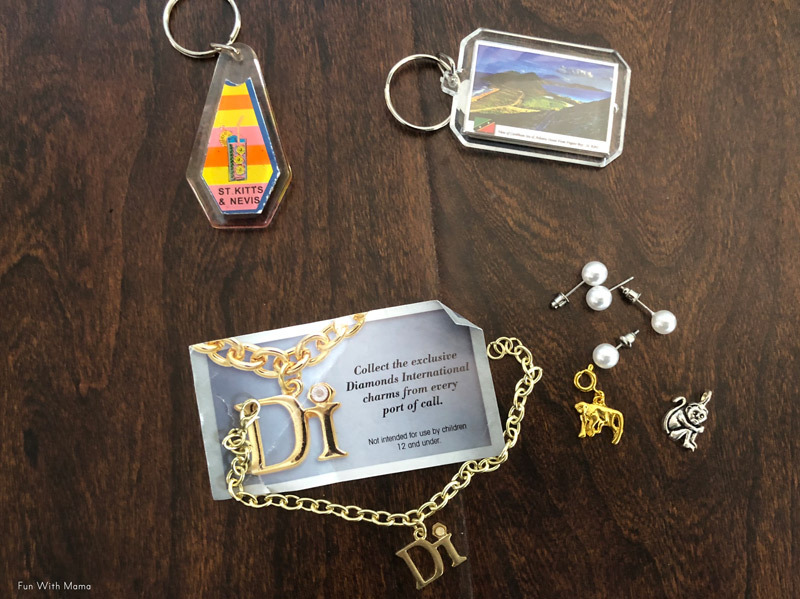 They ranged from little earrings to small keychains. Our treasure hunt fun was cut short by a quick rainstorm that seemed to hit suddenly and then came down pretty hard. Once we had a short rain break, we ran back on to the ship. We made it back in time to grab some pizza for lunch and then go to the themed family art activity called Muffalo Potato. 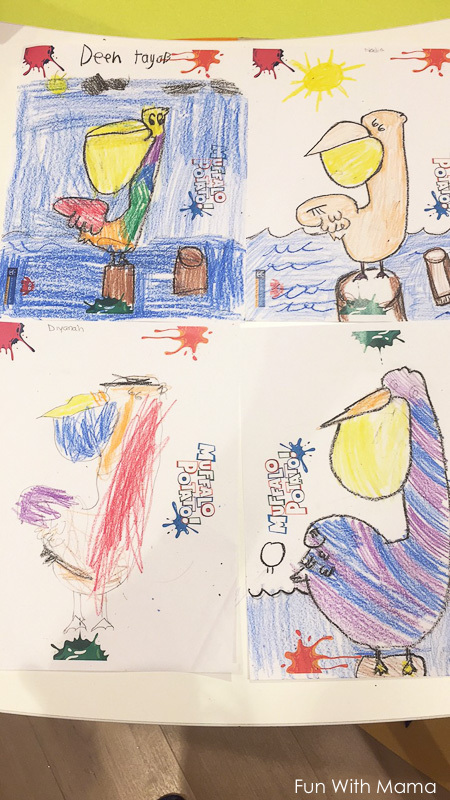 The kids really enjoyed the family activities onboard. The dinner choices were the same as usual, with a few Indian food and vegetarian dishes added on. I just could not get over the wonderful view from our room.. even though there seemed to be a bit of a storm outside. It was still amazing to see. After dinner our evening show was the Columbus show. I found this show okay… nothing spectacular, although my husband and friends enjoyed it! 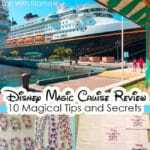 It also comes highly recommended from other cruise goers. We popped by the Karaoke studio almost every night to watch adults sing. 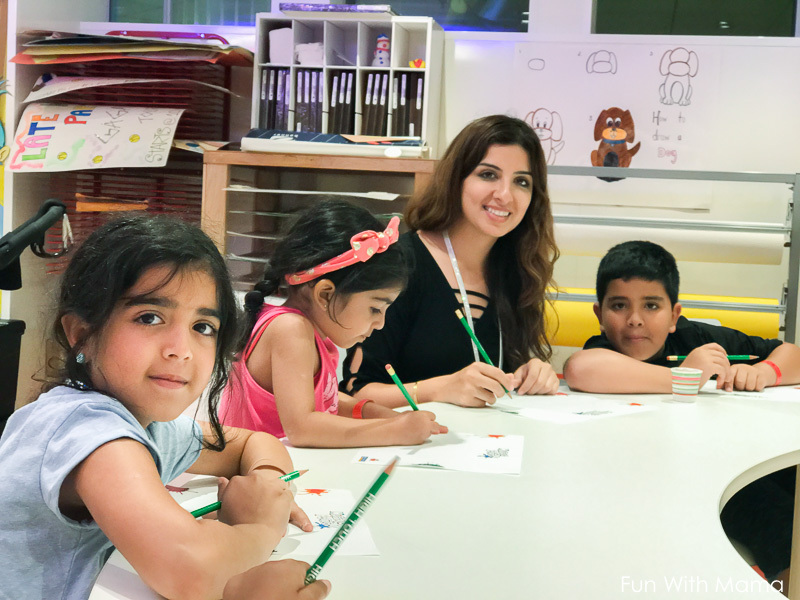 But this night was extra special.. because it was kids night! 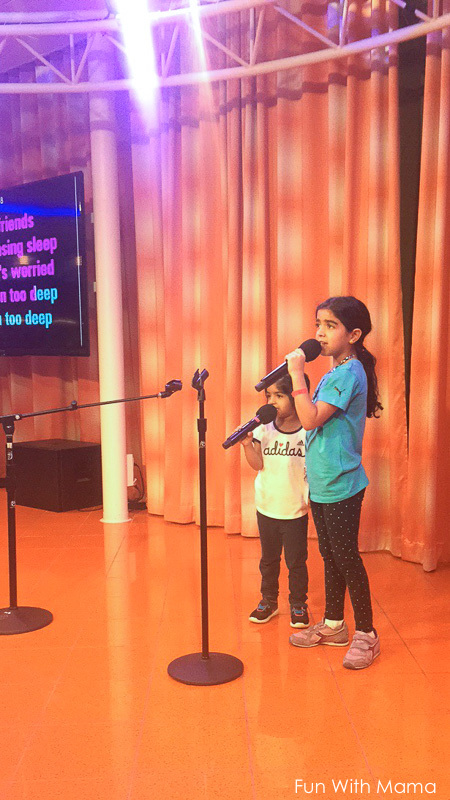 My children each went up and sang their song choice as confidently as ever. The girls sang: The Fight Song and my son sang: Sorry by Justin Bieber. I think out of all of our days, this is the day we did the most on the cruise ship. We woke up early to make it for our 7.45 reservation at the character breakfast. 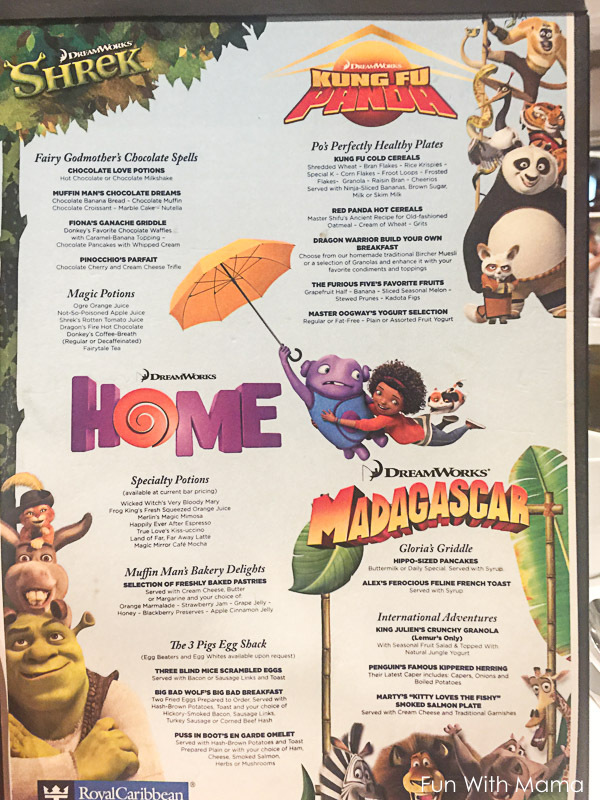 The menu was cute and themed towards Shrek characters. My kids were really looking forward to meeting Shrek but unfortunately, he wasn’t there. They guarantee you three characters, but not which three characters. I ordered Donkey’s Favorite Waffles With Caramel and Banana Topping. As a whole, I wouldn’t really recommend the character breakfast. We then went to play miniature golf. 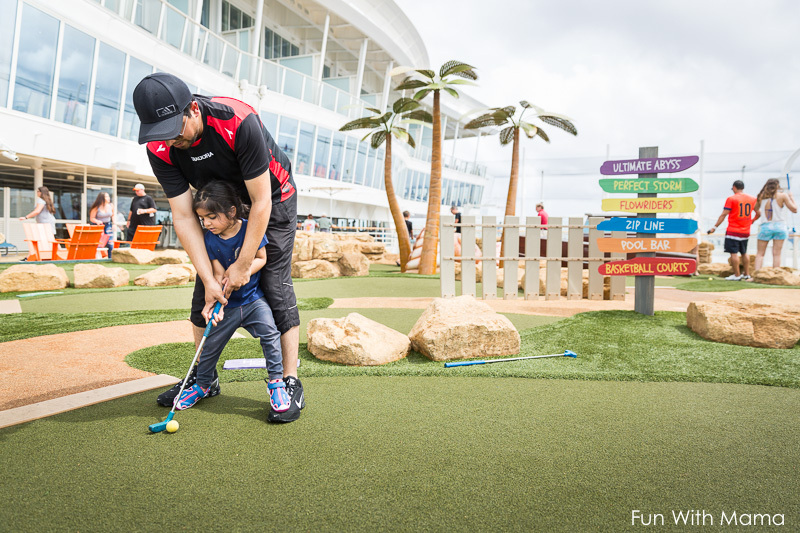 Can you imagine playing miniature golf in a prettier place? 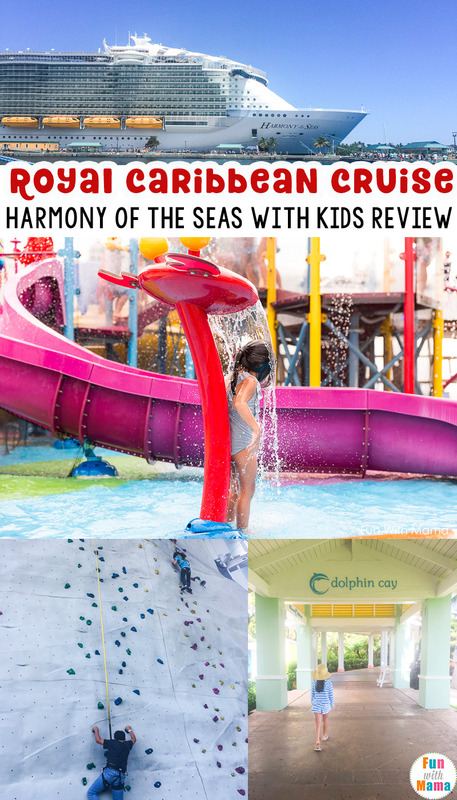 Looking for some Royal Caribbean Harmony of the Seas photo ideas? 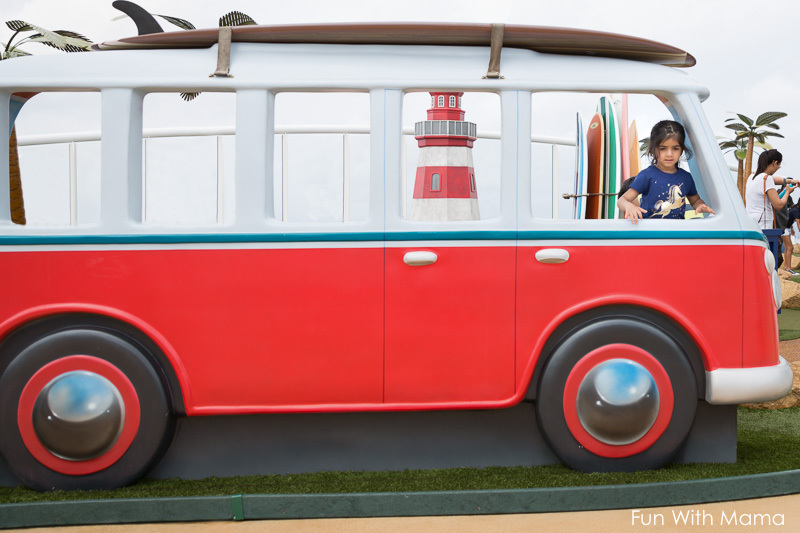 Then take a picture with this van… it’s super cute! 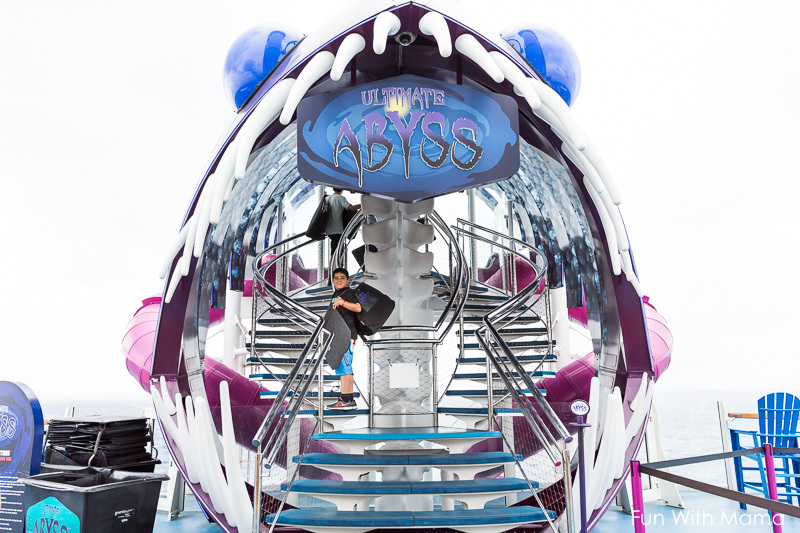 My son decided to try the Ultimate Abyss… is it as scary as it sounds? No… but it sure is fun! How beautiful is that entrance? That’s another thing I wish I had done each and every day. You basically slide down 10 stories! Our husbands participated in a table tennis match while we went to the zipline. Boy, was the Zip line anticipation scary! You basically go from the upper left side of the H below, to the upper right corner of the picture. I had a hard time stepping off the platform and would have preferred to be pushed, ya know.. chicken and all.Once I let go, it was actually a really easy zip line and I definitely recommend that you at least try it. My 8 year old wasn’t tall enough to do it but my 10 year old was able to do it too. I then attended a guacamole making class with my friend. Our husbands took the kids to the boogie boards.. which is like a water surfing activity. I wish we had time to try this too but I guess seven days wasn’t enough time on this large boat. 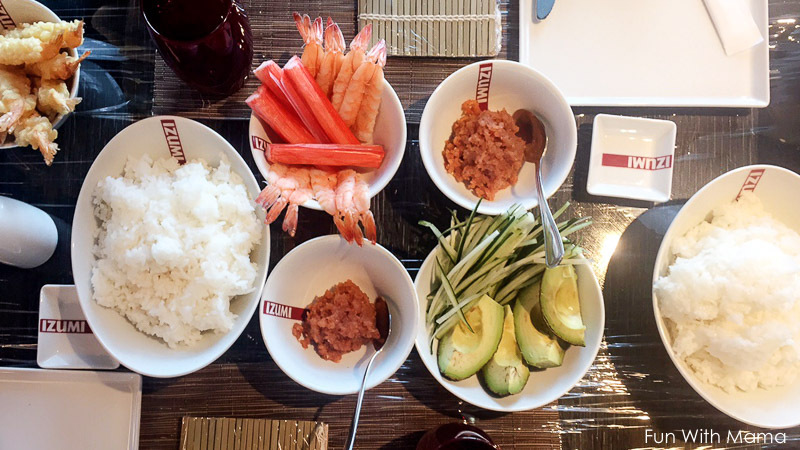 This class was very different from the sushi making class. 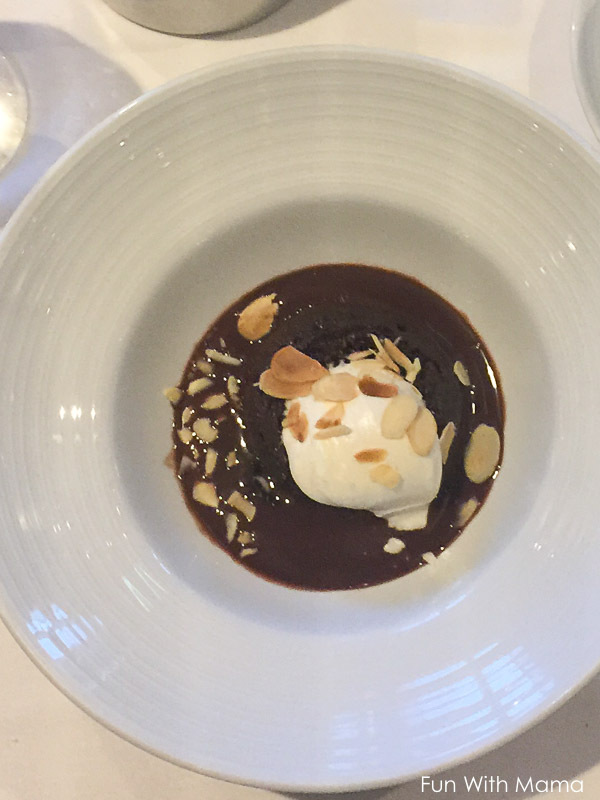 Firstly, it was sort of a dining experience rather than a class. Also, because we could not eat meat from this place, we were very limited on food choices. We opted for water and vegetarian dishes. I thought the class would be more hands on, where we could all individually make guacamole. We watched someone make guacamole. So it was more instructional vs hands on learning. It seemed like it was more of a socializing and dining opportunity. 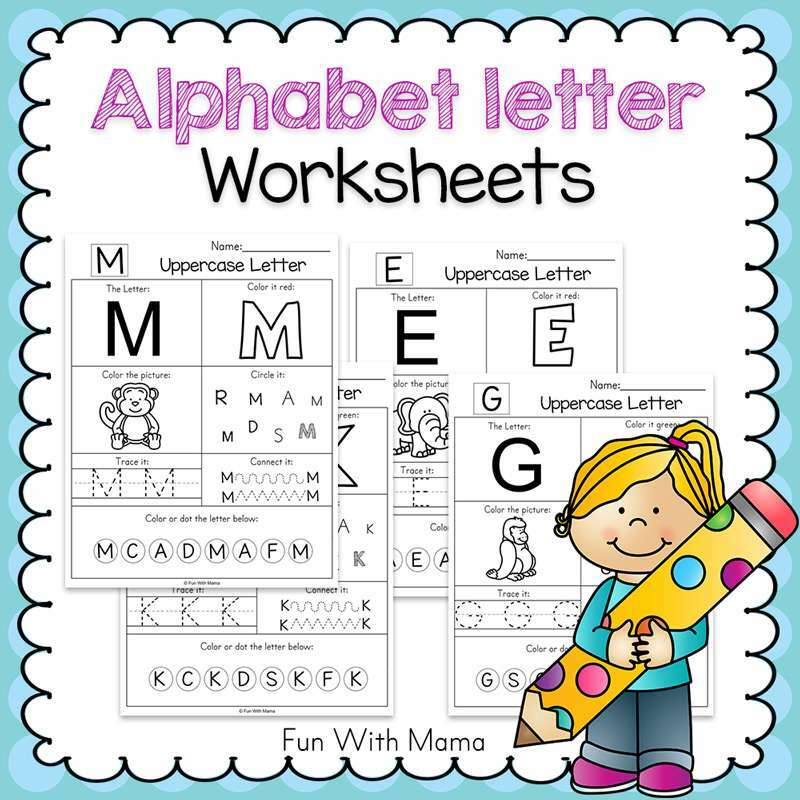 If you are looking for that, then I’d recommend the class. But if you are like me, and looking for a good how to make guacamole class… this class isn’t for you. The food that everyone else ate did look delicious! 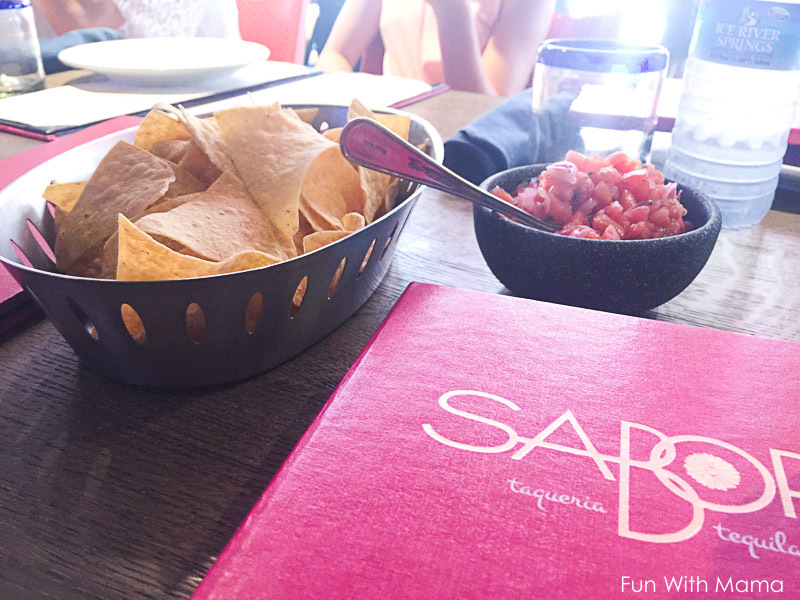 The nacho’s and salsa were amazing! 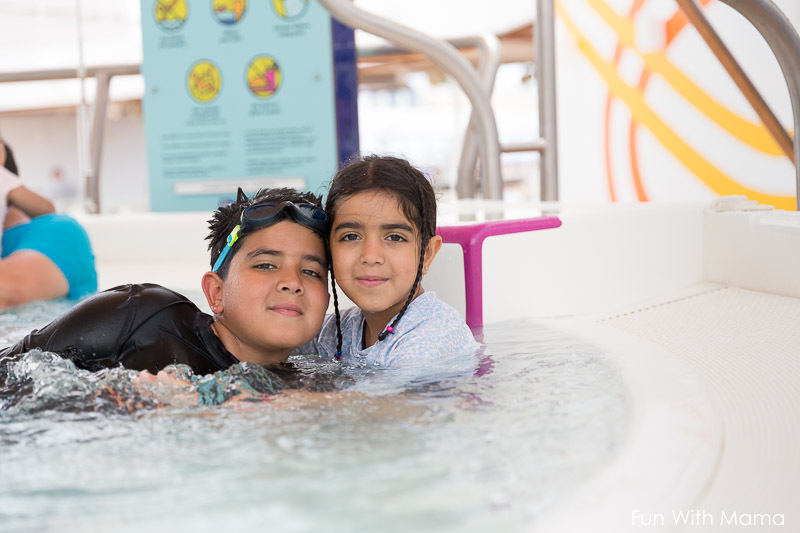 We then joined our families at the pool and splash area. Can you find a more fun splash zone? 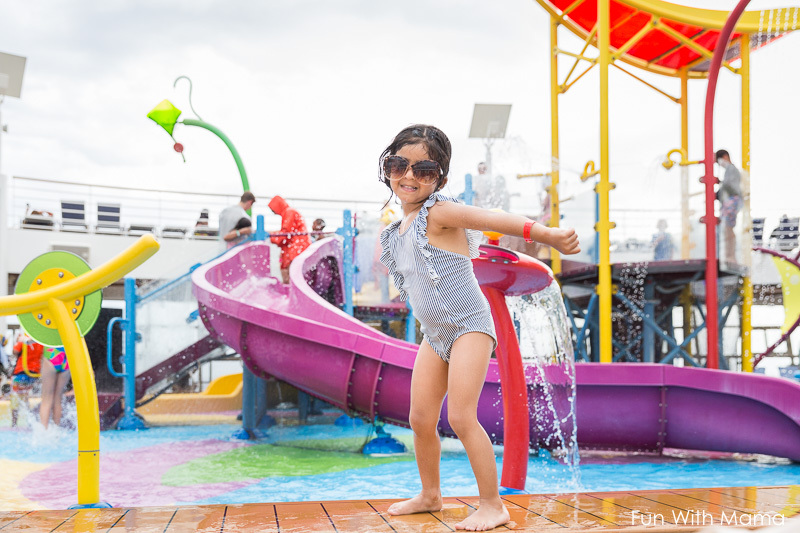 We loved the splash zone on Freedom of the Seas too! My 3 year old was disappointed that she wasn’t allowed to go on the slides, even with an adult. 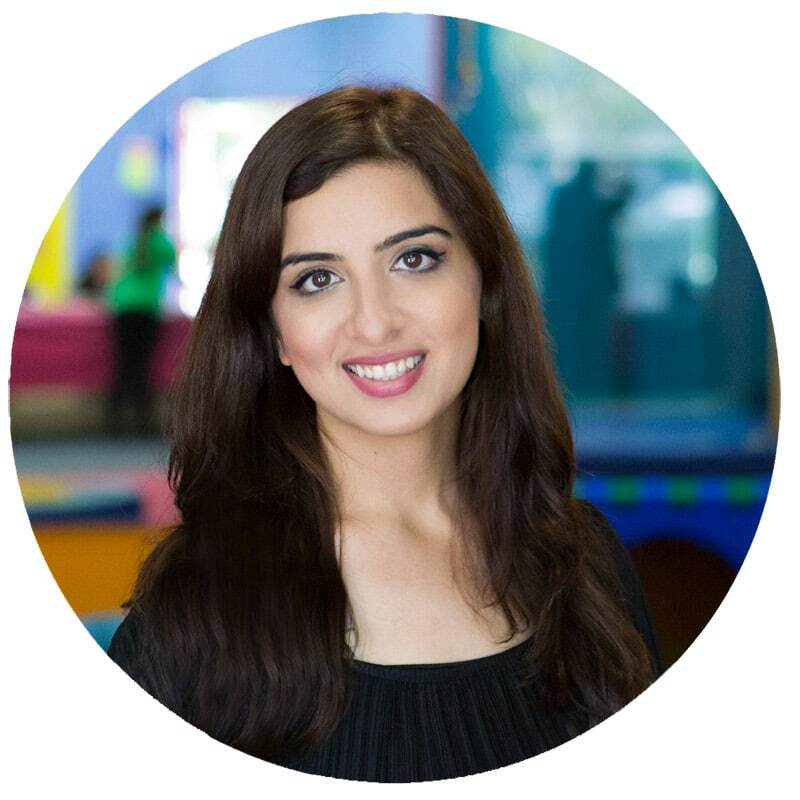 The slides looked fairly easy and I’m assuming that the reason she wasn’t allowed is because the water at the bottom of the slide pools together, which can be dangerous for a young child. She spent a lot of time under the bucket of water that would suddenly fall, playing with the water squirt guns and especially in the jacuzzi. The pools aboard the Harmony of the Seas cruise ship are amazing. She’s always scouting what she can do next. We had a pleasant surprise waiting for us after dinner. Our sweet waiter heard that we loved chocolate covered strawberries… so he made some kind of magic and gave us a plate full to take back to the room. My kids were in heaven! Tonight was formal night so we had many photo opportunities. We went to each and every photo station. After dinner we went for the 1887 ice skating show. During the show my 3 year old felt tired. I wish we had brought a cuddly little blanket for her. A little warm body wrapped around her mama in a snuggly blanket would be perfection. Paired with the lovely coolness from the ice it would be so utterly magical. The 1887 ice skating show is a must watch show. We watched every act in amazement. My little princess wrapped herself around me and fell asleep oh so peacefully. We also went to the adults Quest game show in the evening and that was hilarious. It was so funny to watch all these random challenges that each team was given. I highly recommend you go for this! 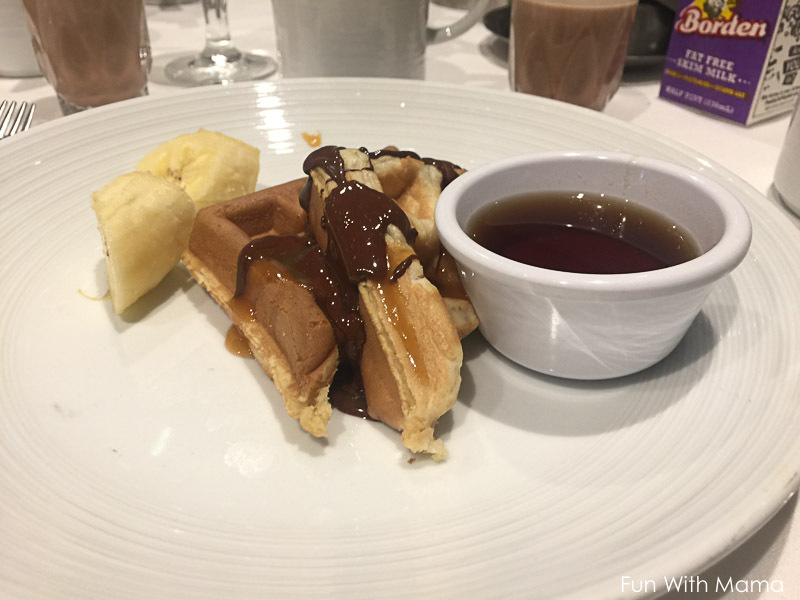 This morning we tried the a la carte breakfast instead of the normal buffet breakfast. It was definitely more relaxed. Then we went to our staterooms to pack our bags for our departure early tomorrow. We didn’t have that much luggage and chose to carry (roll) our luggage off the ship instead of waiting in the line and having the cruise staff move everything for us. I remember on our Freedom of The Seas cruise, that it took really long to disembark with the long lines. We were hoping that this would save us time. We did the Ultimate Abyss slide then went to the ice rink. Unfortunately, by the time we got to the ice rink all the slots were taken. The kids were disappointed. The guy said we could go on stand by.. which we did. We waited for about an hour and finally got a chance to get on the ice… only to be told within 2 minutes (literally 2 minutes) that we needed to be off the ice. 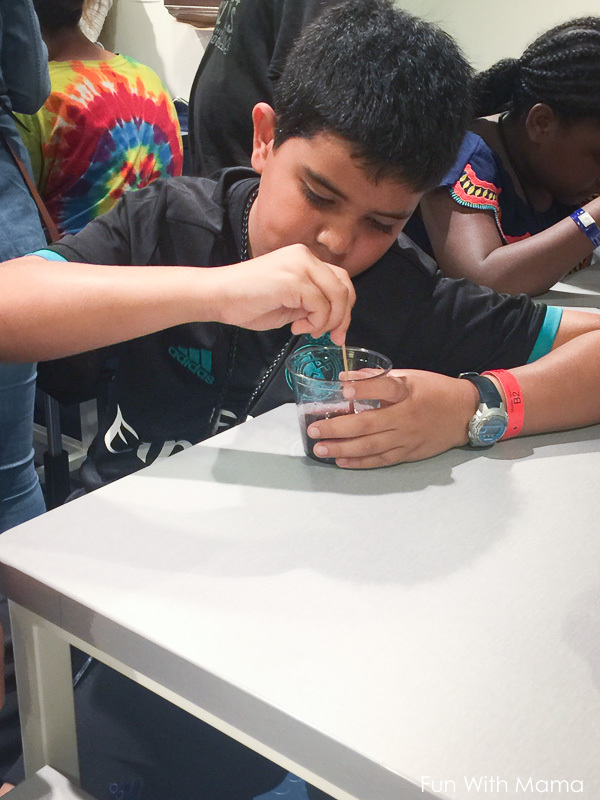 It was really disappointing because the children were really looking forward to this experience. I recommend that you try to get a slot on day 3 and to make your reservation as soon as the ice rink opens for reservations. That is normally about 15 minutes before it officially opens. We also went and purchased our Digital CD this evening. Rock climbing was so much of fun! We waited in line from about 30 minutes before it’s opening time, which ensured that we were first to get on the rocks. That evening, we celebrated my husbands birthday. Then we sent the kids to play at the kids club for the last time and we went for a comedy show. This comedy show was appropriate for children and I kind of wish I brought them for it… but they had a lot of fun at the kids club! 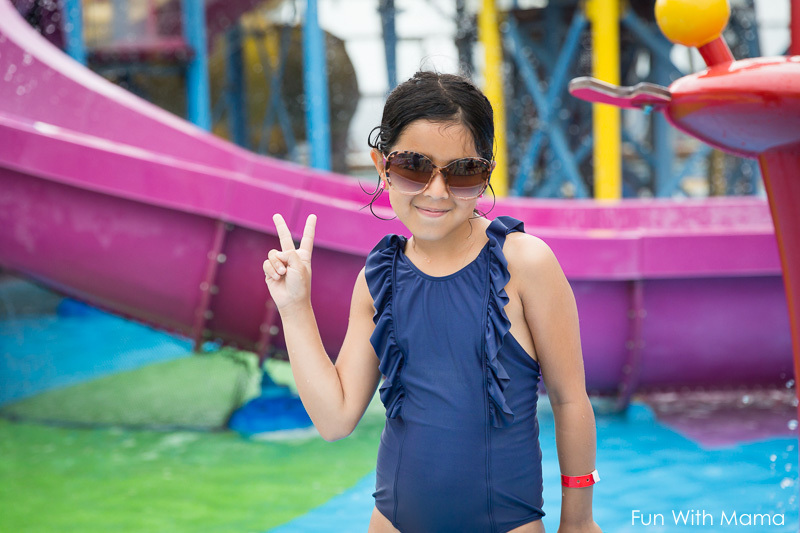 We disembarked on our chosen time slot and it was super easy! I think we will choose to take off our own luggage in the future. That means that all three of my children were in different rooms. 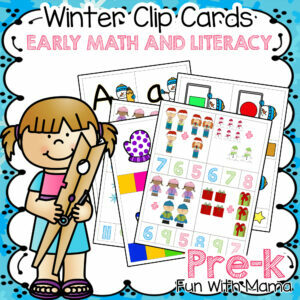 My preschooler absolutely loved every moment in kids club and often asked me to take her there. She said it was fun like school. 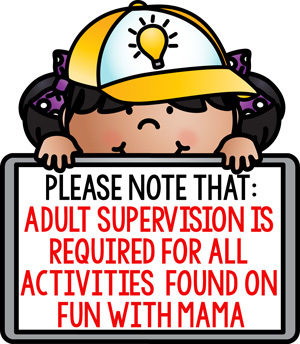 My 8 year old and her friend weren’t as enthusiastic to go to the kids club as they said that some of the staff there were very strict. I am sure that this varies from cruise to cruise. They also wished that they had more free play time. My 10 year old son was neutral, but he might just be at an age were kids club isn’t as exciting as it used to be. A lot of the night time activities did not take place in the actual kids club. The kids were moved upstairs in a room on the deck. 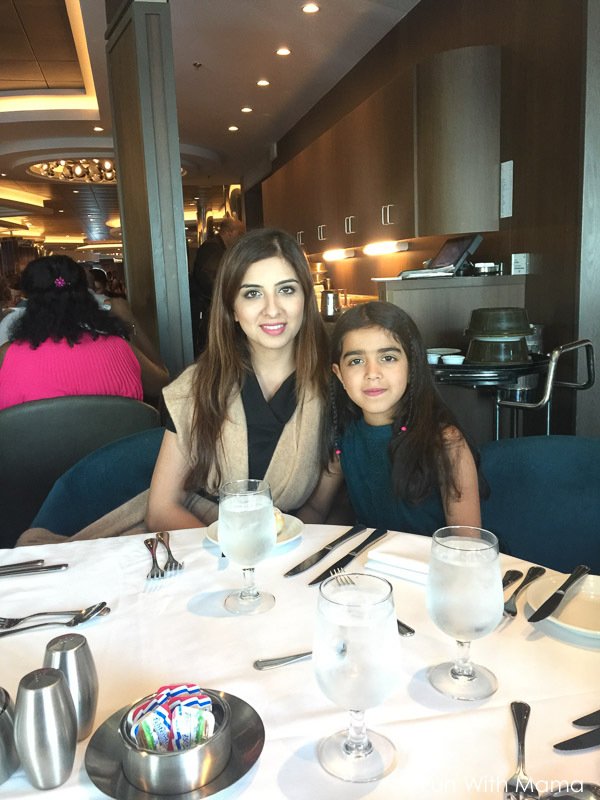 As a parent, it was great being able to have a break or roam around the ship without kids by enrolling them into kids club. I love having the option. 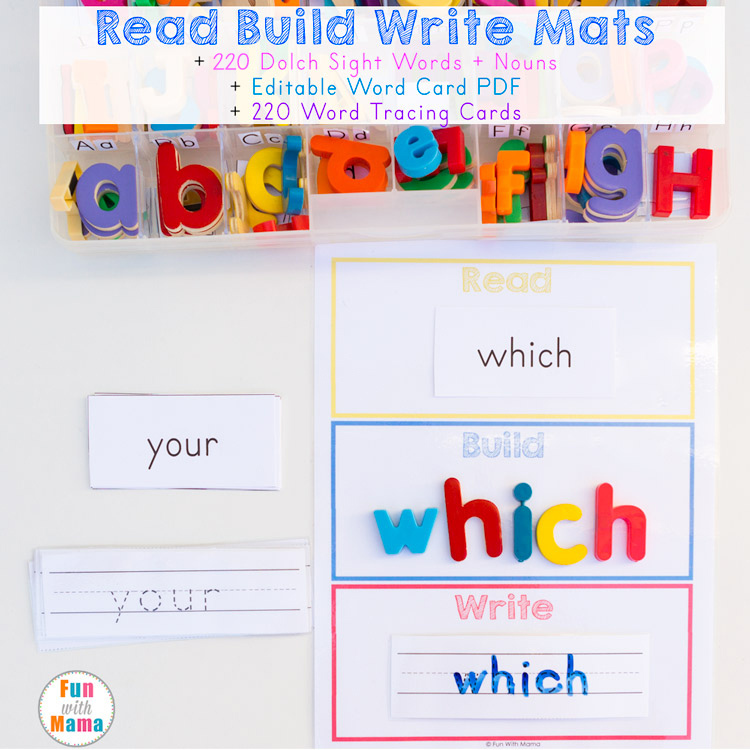 I also love that the calendar of activities allows me to check with the kids and see which activities they wanted to participate in. Royal Caribbean definitely didn’t let us down here. 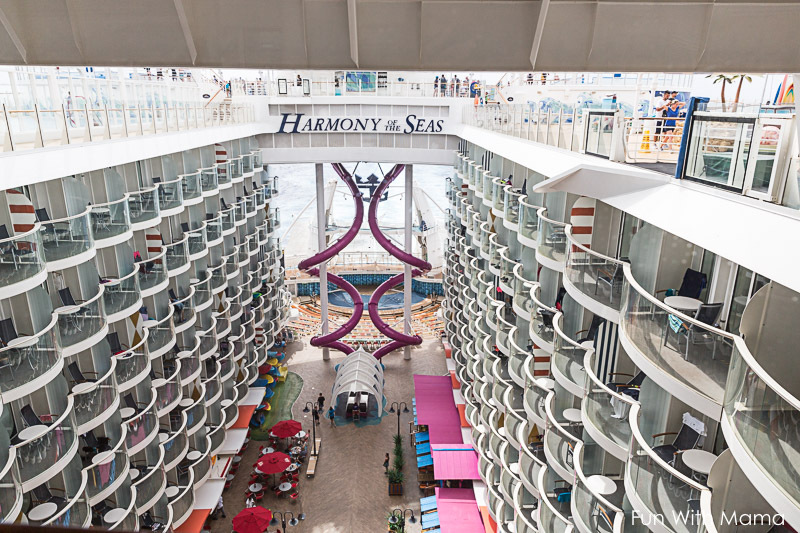 Harmony of the Seas was everything we imagined it to be and more. I did feel that the elevators were often very full and that there were a lot of people on the cruise but that is to be expected with a large cruise. 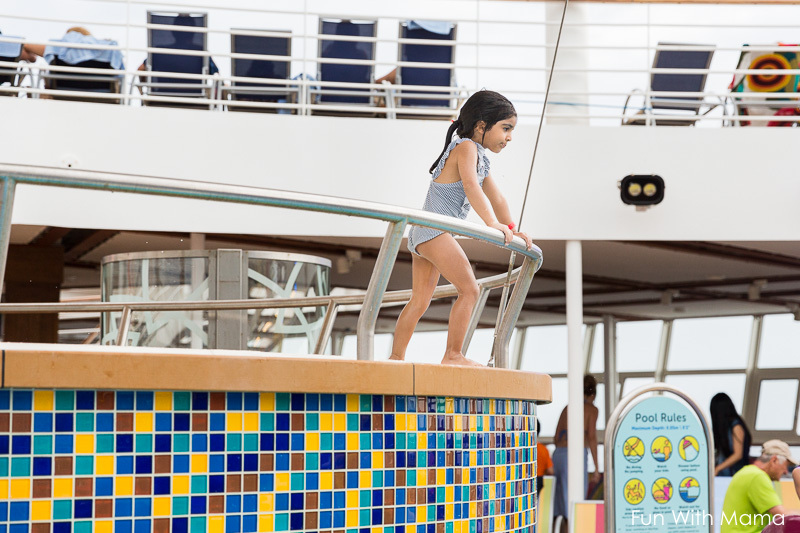 Royal Caribbean knows how to do the best splash zones for children. My kids had so much of fun playing with the water gun, they loved being splashed by the bucket of water that randomly falls on you. I wish I had gone on the slides daily. I did notice that the waiters seemed to be waiting on more tables than they had been on the Freedom of The Seas cruise we went on. I guess that is one of the shortfalls of going on a larger ship. That didn’t mean we didn’t enjoy our dinners. We loved being served each night and is definitely a perk of cruising. 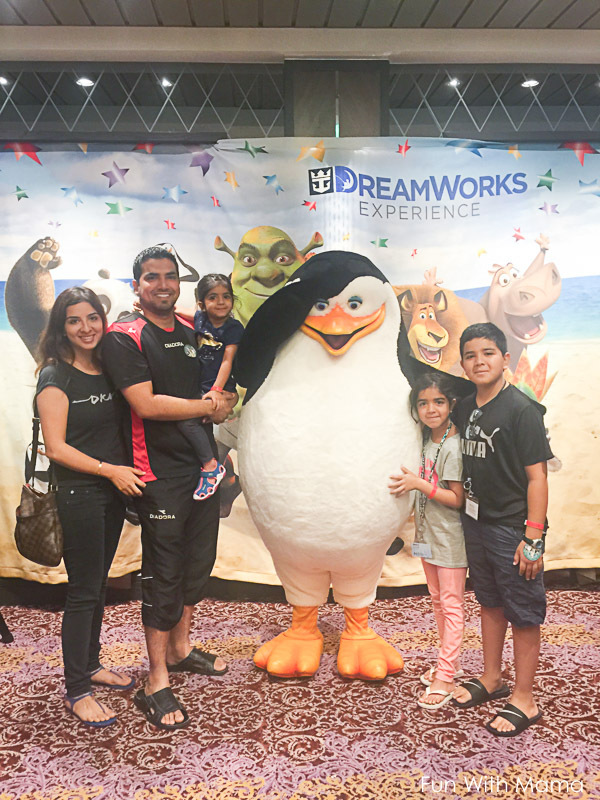 We had an amazing family adventure filled with a lot of fun. 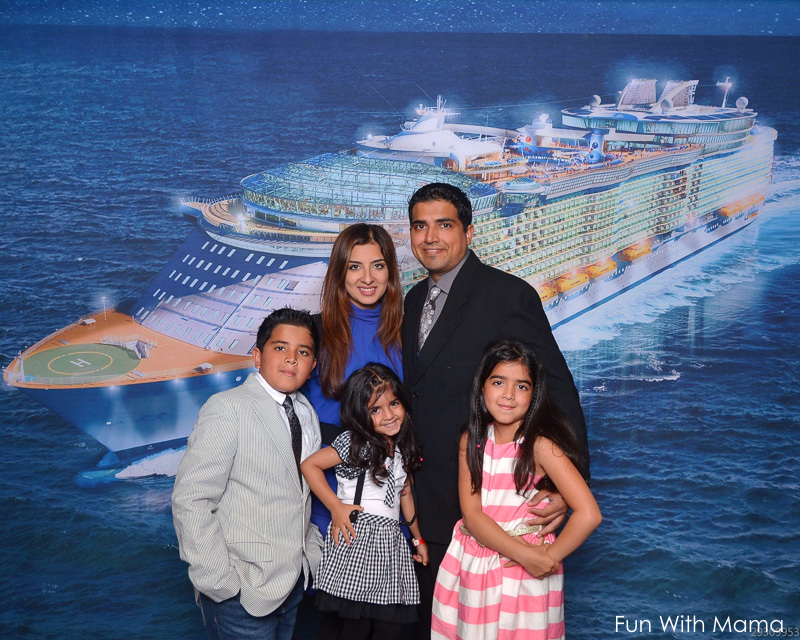 We have the most wonderful memories and pictures and I would definitely go on more Royal Caribbean cruises. 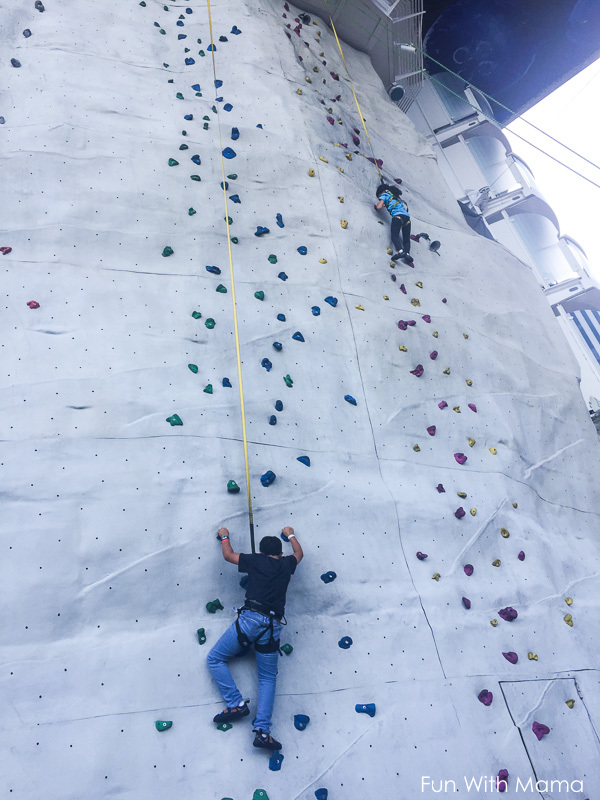 From rock climbing, miniature golf, water slides and karaoke, there is no activity opportunity left untouched! The food was great, our waiters were great, our room was cleaned perfectly. It was the perfect 7 day cruise. 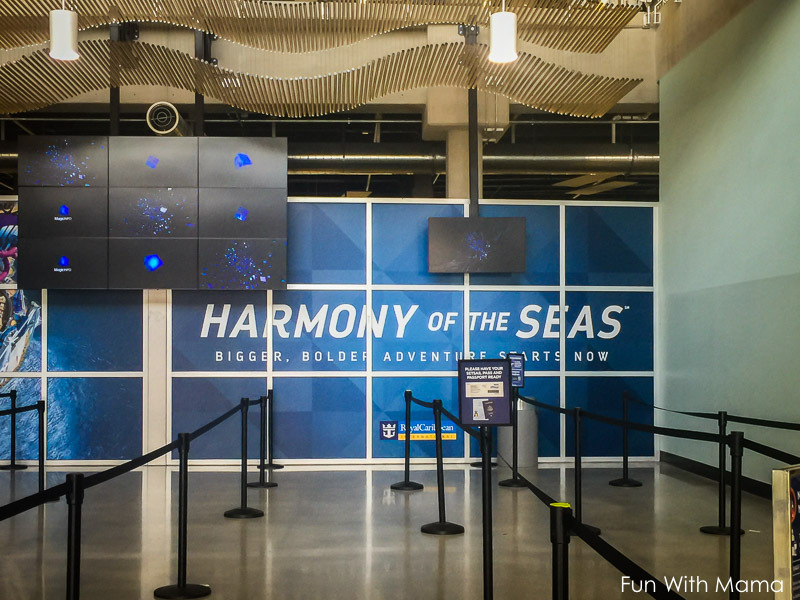 Would I travel on Harmony of the Seas again? YES! 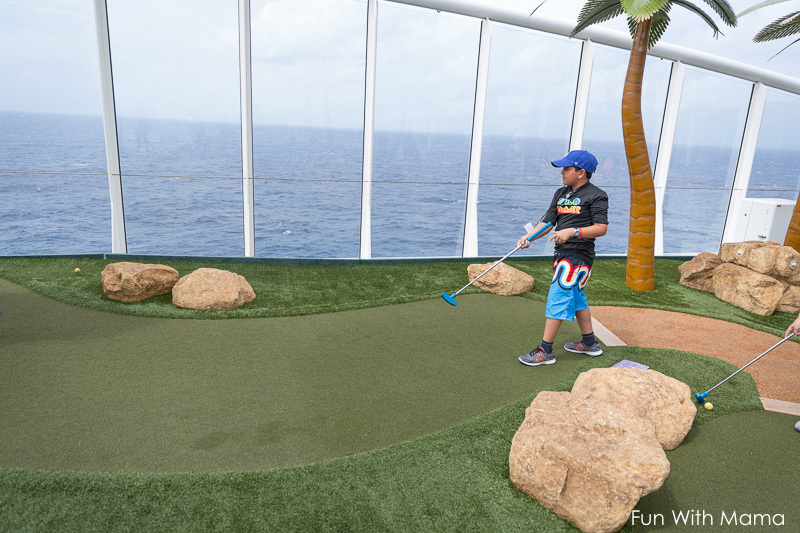 Even though we cruised for seven days there were still so many activities that we didn’t get a chance to do. The silent family disco is one of them! 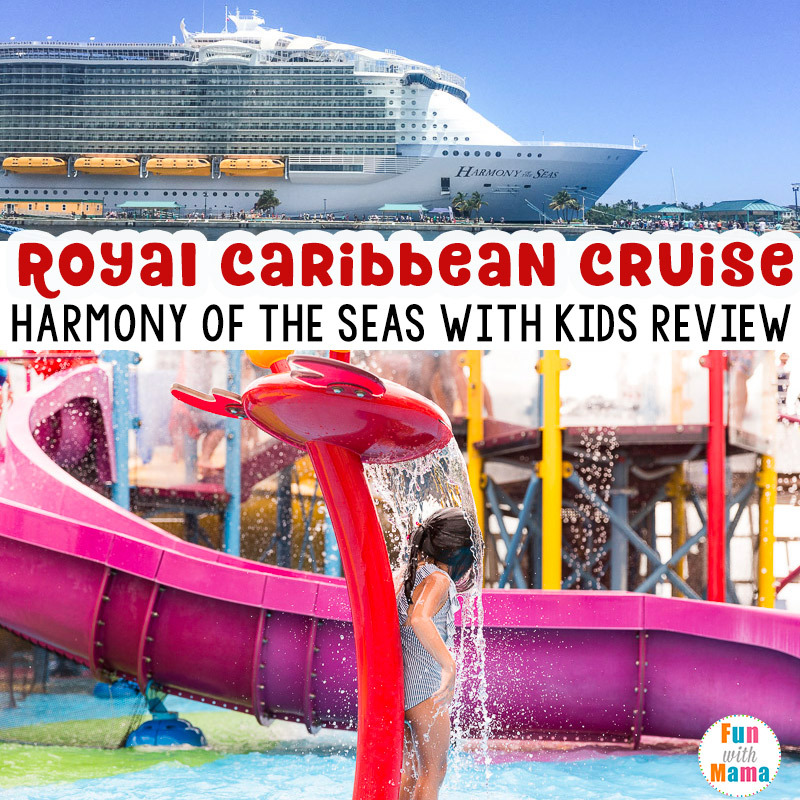 I give Royal Caribbean Harmony Of The Seas a full 5 stars! 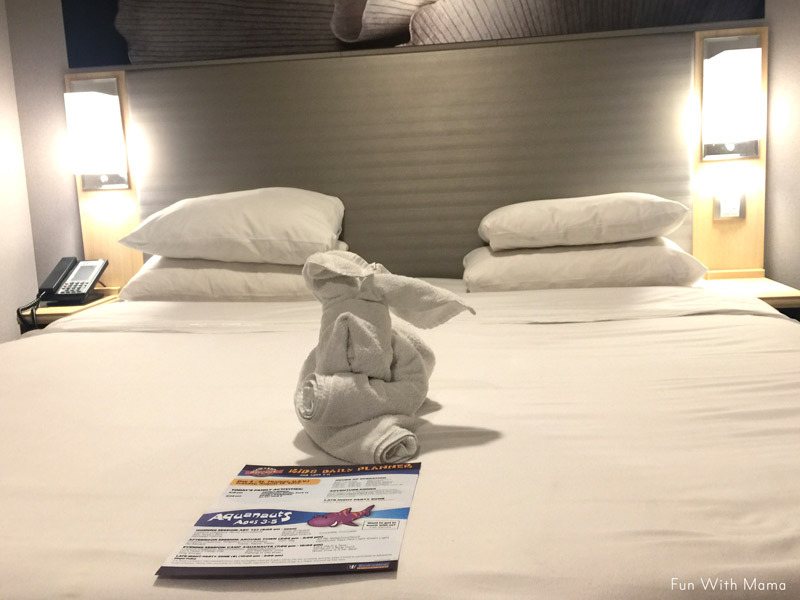 Check out all my favorite Harmony of the Seas Tips here.